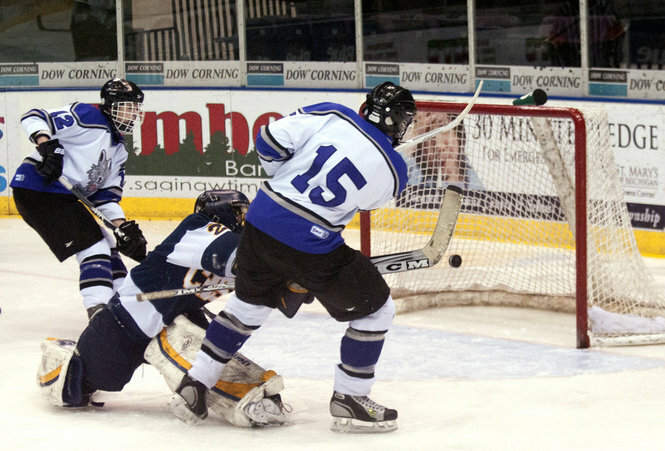 A high-school hockey game. NOTE – image from Google images. It is not a picture of L.’s son. ED. NOTE: My blogging career began with a guest post at Diary of a Mom. That came about after I sent an email to Jess in response to one of her posts, and she read it and said she wanted to expose her readers to it. Saturday night, an amazing story arrived in my email. I knew as soon as I read it that I wanted to share it here, and the author, L., graciously agreed. Please read it and let L. know how you feel in the comments. I have removed all personal reference’s to respect L.’s son’s privacy. The following words are all L.’s, except where indicated. First I have to thank you for sharing your story. After reading yours, I am going to share mine. It is similar to yours but my son is like Ryan and a little older. My son also loves hockey, eats, breathes and sleeps it. He did not love it at first. He started playing when he was 10. Our autism consultant advised us that kids on the spectrum really need to exercise and break a sweat. Fall, spring and summer were no problem but the long winters were a challenge. His three older cousins were hockey players so we decided to give it a try. He started with the Learn to Play hockey program which were mostly 6- and 7-year old kids. That ended and most of the them went on to play hockey. The league president advised us that USA Hockey rules stated [our son] had to be a squirt. We were concerned. The squirts looked pretty good. He spoke with the coach who didn’t seemed too thrilled to have a kid that snowplowed [ed note: a “snowplow” is how beginners first learn to stop on ice skates] on his competitive team but became more receptive when we advised him that we were only looking to have him practice with team. My rotating schedule would not allow any travel. We went to the first and only practice squirt practice it was a disaster. The music was loud which for most kids would be OK. For my son it was causing anxiety. Then the players came out and were skating the circles. The coach told my son to go and join them. The kids were skating repeated laps around him and he skated two circles and made a beeline off the ice. The music and speed were more than he could take. He crunched into a fetal position and trembled. He told me he wanted to go home. It was a day I will never forget. I thought about ending his hockey career. We kept him going to open skates and stick-and-pucks. He wanted to play hockey. We found out that the league to the north of us had house leagues that were considered recreational leagues and they seemed to be a better fit. We signed him up and he played a full season at 11. Our son was on a team, for the first time in his life. A developmental pediatrician had told us that he would probably never play a team sport. WOW! At 12, the game became faster. He was struggling to keep up with the speed. I was concerned that he started hockey too late and was on borrowed time. I thought his hockey future was in jeopardy. That year, he was put on a team that had no goalie. He was the worst kid on the worst team and they had no goalie, I didn’t realize that we had gotten lucky. All the kids rotated in the net and they lost every game … by double digits. He wanted to try [playing goalie] because he felt he could do better than this teammates had. I wasn’t sure he could. I was wrong because the day he played goalie his team lost 6-4. You would have thought they won a championship. The team was ecstatic and a goalie was born. They were competitive for the rest of that year. They even won a few games. They lost the consolation game by one goal. We bounced around for the next few years playing in any league that I could find that needed a goalie and that didn’t have travel. In the meantime he would study every goalie on YouTube, TV or any game we could go to. Only a parent with a child on the spectrum could understand how much he studied them. He became fairly good and was self-taught. He was even well liked by his various teammates … goalies are allowed to be quirky. My schedule finally changed and he could play travel. He tried out for the Bantam B team and didn’t make it. They offered to keep him as an alternate and let him practice with the team. He was 14. Fast forward to last year. He never played in our local youth hockey league because they only had travel. He also attended a local Catholic high school because of the small class sizes. He hated it because it is a baseball school and that is all the kids talked about. Not one hockey player in the school. He was an unhappy kid and we feared he was bordering on depression. Our public school districts high school team won the state ice hockey championship and we went to many of the games together. He dreamed of playing for them and to be quite frank, I didn’t know if he was good enough, he had never even played or made a travel team. Last summer he/we had a life-changing event. The local high school coach hosted a youth hockey summer clinic … two age groups and one was High School-aged. My son was going to be a sophomore (now 15) and wanted to go. I let him just so he could experience playing with high school players. After the clinic the coach wanted to speak with me. He advised me that my son was technically perfect and he had never seen any goalie track a puck like him (his autism at work)*. He told me my son was very good and wanted to know what school district we lived in. He was floored when I told him that it was his. He had never even heard of my son and he thought he knew of all the goalies in the area, especially in his district. We told him that he went to the local Catholic high school and didn’t play in the local youth hockey league. He was even more amazed when I told him he was self-taught. He told me he was good enough to compete with the two seniors for a starting position. I was in shock. He asked if I minded if he checked with the state high school governing body to see if he could play for his team, while attending the Catholic H.S. He couldn’t and he would have to attend the public high school if he was going to play. We didn’t want to move him to the public high school and he understood and respected our position. He was on track for a high school diploma and we really didn’t want to chance the change. Once my son found out that he could probably make the team and that we were not going to send him to the public school, well it was bad. To make it worse, the captains from the high school team were texting him asking if he was going to switch schools. He would see the players at the stick-and-pucks and they were all trying to recruit him. This was so tough for us. The first three weeks of his school year was classic depression and we were concerned. My wife and I always felt his social well-being was equally as important as his academics and we decided to take the chance and move him to the public high school. It was a hard decision. Our public school did not have the best reputation for dealing with the kids on the spectrum. He made the high school team and competed with three other goalies for ice time. He did play in three games and did well in all of them. Since he had never played travel, he did Midgets as well. Today, he is a junior. Our school has made improvements in its special education department and has been great to work with. He is still on track to graduate and will be playing for the high school team again. This year he will compete for the starting position and we are still one of the top teams in the state. His self-esteem is through the roof and his peers think his quirkiness is from taking “too many pucks to the head.” His coaches know he is on the spectrum and welcome him. In fact they really like him. As a bonus, he made a friend, another hockey player on the spectrum. He is not on the school team … yet. Every day, I am amazed at how far my son has come. He, like Ryan, is an extremely hard worker. Hockey has changed my son and only for the better. I am glad to see the same for Ryan and others. Thank you L. for sharing this story. I can relate to so much in your words. 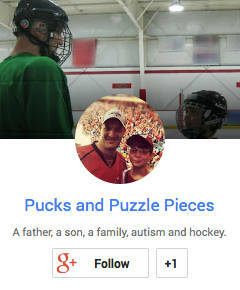 From the internal debate between pushing a child vs. the desire to protect them, to the fear about them “fitting in” on a typical team, to the son’s unhappiness at not being able to find friends who also like hockey, to the concerns about his social as well as academic well-being, to the amazement at the child’s ultimate triumph. L., you are a terrific dad and I’ll be pulling for you son this season! This had me in tears as I stood reading in front of the stove waiting for cookies to bake. Thank you so much L and Neil, for sharing your stories. I’m glad you enjoyed it. I was gripped from the moment L.’s email hit my inbox. Great, great story. Thank you L for sticking with your child and helping him with something he wanted to do, not just those things that he needed to do. Excellent take. L. is to be commended for his parenting approach for sure. I have to give credit to my wife. We work as a team and she is clearly the team leader. She is awesome when it comes to advocating for our son. Our son’s work ethic also needs to be commended, he is outside doing “off ice goalie drills” as I type this. Most of his hockey career has been playing catch-up to his peers. He has worked so hard to get where he is. He is an inspiration and I am so proud of him! As most of you know, there are so many ups and downs with a child in the spectrum. This is just one of the “ups”. Thanks for letting me share his story.